Connecting the Javea port to the Arenal end of Javea is this main dual carriageway called Avenida Augusta, this is one of the main roads in Javea that many apartment blocks and complexes are located, due to the close proximity of both Javea port and the arenal beach this area makes the ideal location to purchase a newly built apartment for sale in Javea. The majority of the apartment complexes were built over the past 15 years, replacing plots of land where orange and almond trees were once producing fruit and nuts a main source of income for local residents. all of these plots have been replaced with modern apartment complexes containing ground floor apartments, penthouse apartments with pools and garden areas and of course all within just a short walk to the main beach area. most of the apartments come with a parking space and store room called trastero, you will of course benefit from your own private parking place, especially within the July and August summer months as we have a big influx of Spanish who mainly live in Madrid and Valencia who come to stay in their apartments for this period, along with many visitors from Europe and also around the world. 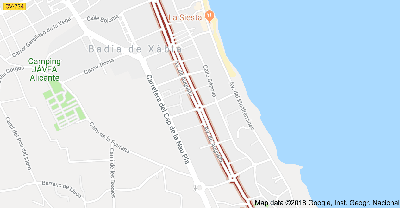 Javea is a wonderful place to spend a holiday, you can almost guarantee the Javea weather, boasting a minimum of 340 days of glorious sunshine and blue skies. Local businesses on this road: Mercadona Supermarket, Chemist.